Petco has us officially excited for the holidays. We love it’s latest promotion – and not just because we’re pet people at ePromos. Petco’s Paw Prints event is an excellent way to draw customers into stores, give them a fun experience with their pets, and send them home with a tangible keepsake. Here’s what Petco, the pet-specialty retailer with more than 1,300 locations, is doing: It’s creating some festive fun by offering shoppers the chance to make free paw print art in its stores. People bring in their pets, paws get pressed into clay, fun gets had, and boom – Petco just created an epic brand experience. It’s suddenly way more enticing to stop into Petco than some other pet supply store. Pet owners leave with a great promotional product – a logo tin containing their dog’s paw print smooshed into clay – and happy feelings about Petco. People love free stuff, and they naturally feel more positively about companies that give them this free stuff. Let’s examine what makes this promotion so great. Here’s a look at the e-mail that Petco sent to customers. 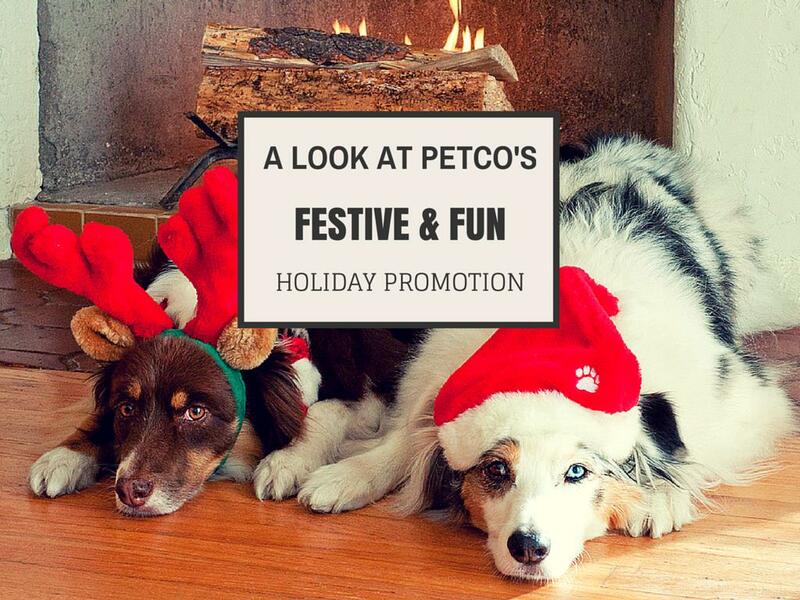 The holidays are on everybody’s mind, and Petco knows it. There are snowflakes on the promotional tin, snowflakes in the e-mail blast, and an overall festive feel to the whole promotion. Petco isn’t just handing out promotional products – it’s creating a holiday event at which people get to make cherished keepsakes. What your business can do: Play into the holiday theme with something relevant to your brand. For example, bakeries might host a cookie-decorating party and give custom cookie cutters with its holiday treats. Think about something exciting that would draw your customers in. Don’t just hand out logo products – create an experience. It’s tailored perfectly to the audience. Petco markets to pet owners. So naturally, a paw print keepsake is something appealing to its target audience. Petco thought about who would be receiving its promotional products, and it gave items that recipients would actually want. What your business can do: Always think about who will be on the receiving end of your promotional giveaways. What would they like to receive? And what makes sense for your brand to give away? These are two key questions to ask any time you’re planning a promotion. Petco isn’t afraid to get any hands (or paws) dirty with this promo. This isn’t some tired, ho-hum giveaway – it has all the makings of a lively, memorable in-store event. Petco is aiming to deliver an unforgettable experience for pet owners just in time for the holidays. What your business can do: Kick up the fun factor of your promotion by getting your audience involved. Let your customers get hands-on in some way. Lowe’s does a great job of this with its Build and Grow workshops. If you want people to participate, make it fun. 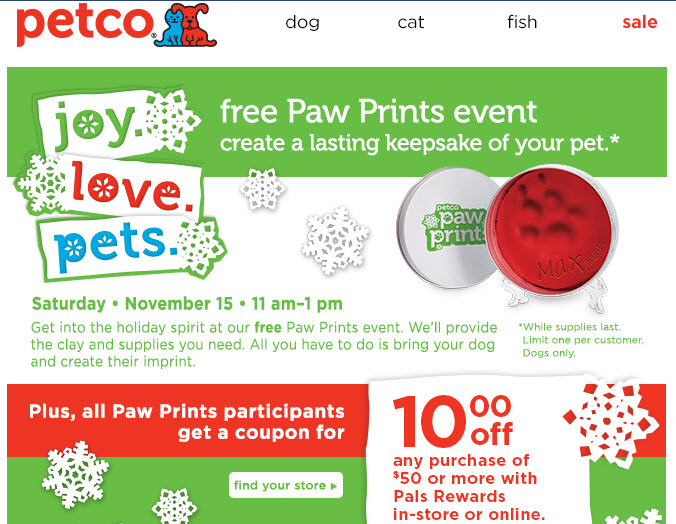 Petco is offering customers a coupon – $10 off $50 – when they participate in the Paw Prints event. Shoppers appreciate the savings, and Petco has just given them an incentive to spend $50. They’re already in the store for the event, and the coupon makes it enticing to browse for pet holiday gifts. What your business can do: Round out your promotion with an appealing special offer. It doesn’t have to be a dollar-off discount, either. Coffee shops, for example, could give out coupons for free peppermint hot chocolate during the holidays. Always consider what would motivate your customers to come back. Petco gets a lot of things right with its Paw Prints event. It’s an engaging, on-brand promotion just in time for the holidays. Your business can get in on the holiday fun, too. Just think about your audience and their interests, mix in a little fun, and you have the foundation of a smart holiday promotion. Is your business planning a promotion or event for the holidays? Tell us about it!